There is no way to know in advance the “optimum” fracture design. Previously, it took too much time to simulate all the variable combinations that impact fracture propagation. Setting up and running large numbers of simulations one at a time was not practical. With StimPlan V8 Cloud, you now have the ability to run dozens of designs in less time than you previously spent completing a single simulation—without the cost of adding hardware! Our Midland Basin case study showcases how StimPlan V8 Cloud can be utilized to improve frac design. When first developing an area, operators typically apply treatment designs that are analogous to their neighbors’. But given the inherent complexity and stress heterogeneity of these unconventional plays, that’s often not the best practice. With StimPlan V8 Cloud, you can mitigate the uncertainty by simulating all possible scenarios ahead of the drill bit, thereby avoiding the costs of using the “trial and error” method of drilling and completing wells to optimize the design. Our Midland Basin case study showcases how StimPlan V8 Cloud can be utilized to optimize frac design. 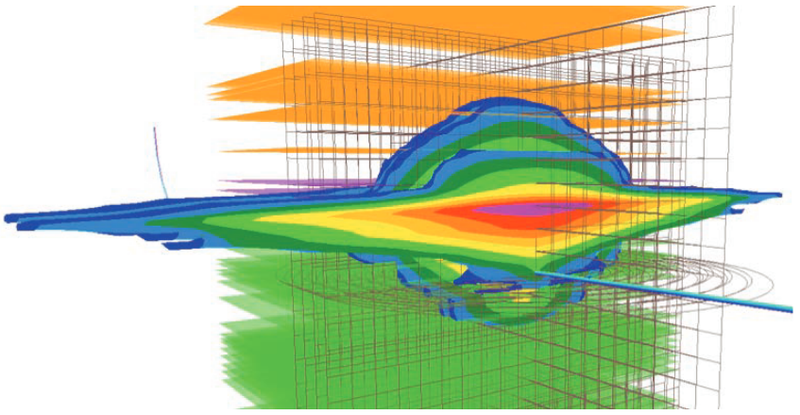 As is typical for the Midland Basin and other unconventional reservoirs, this case study has a complex geological system, requiring detailed finite element layering to accurately model. StimPlan V8’s flexible 3-D grid generation is much more adept than a fixed-grid approach for modeling such stratigraphically complex reservoirs. 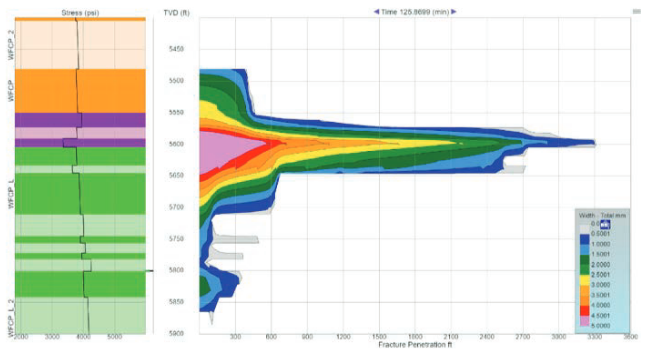 With StimPlan V8 Cloud we were able to quickly vary and test several critical factors in our case study that influence fracture length and height growth, namely landing depths, pump rate, and the amount of fluid and proppant pumped. Other factors, such as fluid rheology and proppant type, could have easily been added to the variable matrix. The column charts below show Frac Length and Frac Height vs Pump Schedule and Landing Depth. Clearly Frac Length grows substantially with the shallower landing depth cases, indicating a risk of slamming into the adjacent wells. Less dramatic, but still significant differences in frac geometry occur with changes in pump rate and volume with the greater landing depths. Such insight would not be possible by running just a handful of simulations. With StimPlan V8 Cloud, all 72 of the simulations used to generate these charts ran in less than an hour—about 0.5% of the time that would have been required to run on StimPlan V7. Make the transition from estimation to optimization with more accuracy and speed. The first step to design the best well is to find the best possible outcome for a single cluster. 72 scenarios from the parameters above were modeled to narrow in on THE ONE. All 72 simulations were completed in less than ONE hour with StimPlan V8 cloud-based simultaneous simulation capability. Once the best cluster design is achieved, the next step is to optimize each stimulation stage. Utilizing the best design out of the 72 simulations, parallel simulations are run to converge on the optimal number of clusters and ideal cluster spacing. 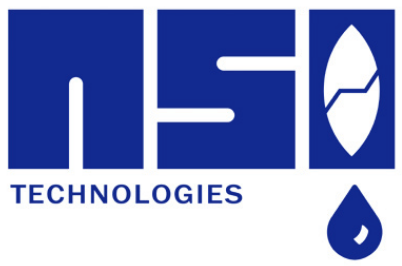 In this case study, stages with three to five clusters were evaluated with spacing ranging from 50 ft to 75ft. With the power of StimPlan V8 Cloud, complete stage optimization is achieved in a day. CONTINUING TO PUSH THE BOUNDARIES OF MULTIPLE CORE PROCESSING DON’T SACRIFICE DETAIL AND ACCURACY FOR SPEED. NOW YOU CAN HAVE IT ALL. Whether Running StimPlan V8’s proprietary 3D finite element simulator in the cloud, or on your local, multi-core machine; the processing times have been significantly decreased—without sacrificing any of the analytical rigor that has distinguished StimPlan V8 from other frac models that take shortcuts to run faster. With StimPlan V8 Cloud, not only is the run time for each simulation significantly faster, overall project completion time is RADICALLY REDUCED because you can now run dozens of simulations simultaneously with almost no burden on your computer. It is really amazing. StimPlan V8 realizes the potential and competitive advantage of the cloud-based computing environment with many improvements made to the core software, enabling HIGHLY LAYERED AND SMALL GRID simulations to be completed many times faster than previous versions. You no longer have to sacrifice analytical rigor for speed. The more complex the simulations, the greater the time savings with New StimPlan V8!